Laigueglia hotels holidays on line sea beach hotels bed breakfast residence villas self-catering accommodation. This graceful city was named Aquilia during the Roman age, for the near thermal spas. Laigueglia is today a renokwn tourist center able to attract always more numerous persons, with the preragativa to offer an ideal resort to spend a pleasant stay and relax, in any season. The locality has become today an updated and mild citiy where old and new are mixed harmonically and it boasts a characteristic historical center full of regional coastline atmosphere and old time taste. Do not miss to visit: the Tower, the most ancient building that had been erected to protect the city, the Oratory of Santa Maria Maddalena and the Monumental Church of San Matteo. Hotel Villa Ida is a three-star hotel in Alassio, situated near the historic centre and the beach. Hotel guests can enjoy a health club with sauna, solarium and massage room. On Villa Ida premises the restaurant serves traditional dishes, while public spaces are covered by free wi-fi connection. The rooms are comfortable and air conditioned. The Splendid Mare Hotel is a three-star hotel in Alassio, housed in a historic mansion once a monastery. A few minutes separate the hotel from the Promenade in the Gulf of Alassio and from Albenga nearby. The Splendid Mare hotel has every comfort in the rooms, equipped with air conditioning, wi-fi and satellite TV. As for the activities recommended, snorkelling and hiking are the favourite ones. The Locanda dei Fiori Hotel is a three- star hotel in Alassio, which can give the guests wonderful sea views. The hotel is located near the beach and the city centre. The Locanda dei Fiori has free car parking and restaurant serving Italian dishes. The motorway is a few minutes' drive from the hotel, whose rooms are also equipped with television. Hotel Del Golfo is a two-star hotel in Alassio, perfect for holidays at the seaside, at a few metres from the beach. Hotel guests can enjoy a sun terrace, the restaurant service and a lounge bar where to enjoy a refreshing drink. The rooms of Hotel Del Golfo boast every comfort. After a day at sea, a visit to the old town is surely pleasant. Find the ideal hotel for your holiday in the seaside resort of Laigueglia! Check our special seaside offers for Laigueglia: choose your hotel with a sea view for your next summer holidays by checking the hotel and accomodation list in our guide. Treat yourself to one of Laigueglia's hotels with a private beach, a few steps from the sea or choose to stay in a hotel in Laigueglia with a swimming pool by the sea. Use our guide to book one of the hotels in Laigueglia which provide rooms with a view of the sea. Look on the map for hotels close to the sea and the beach in Laigueglia. Hotels with parking in Laigueglia ? If you have decided to travel to Laigueglia by car or motorbike, don't worry about finding a parking space or leaving your vehicle unattended. Display the list of hotels and accomodation in Laigueglia provided with a parking place or a garage. Book a hotel in Laigueglia with a parking area! Pet-friendly hotels in Laigueglia ? Don't leave your dog at home. Use our guide to check the list of hotels and accomodation that welcome dogs in Laigueglia. It is also possible, from our selected list of hotels and accomodation where animals are allowed in Laigueglia, to keep your dog in the room with you! Check our offers of hotels and accomodation in Laigueglia with rooms equipped for the disabled! For your stay in Laigueglia, book a hotel accessible to disabled people. Choose your hotel in Laigueglia from the list of hotels equipped to welcome disabled people! Wi-Fi hotels in Laigueglia ? Are you looking for a hotel or accomodation with a quick internet access and wi.fi? Click on the list of hotels in Laigueglia which have a wireless connection to internet and wi.fi. Gay-friendly hotels in Laigueglia ? 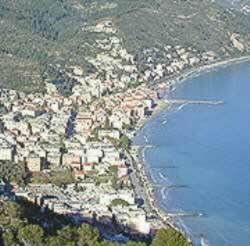 Look for gay friendly hotels or gay friendly accomodation in Laigueglia, choose to sleep in a gay friendly hotel or gay friendly accomodation in Laigueglia! Take advantage of our offers of gay friendly hotels or gay friendly accomodation to book your holidays in Laigueglia.